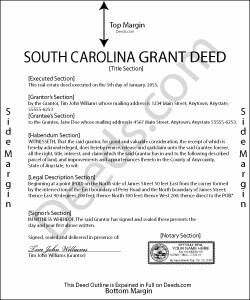 In South Carolina, title to real property can be transferred from one party to another by executing a grant deed. Use a grant deed to transfer a fee simple interest with some covenants of title. The words "grant, bargain, sell, and release" in the conveyancing clause signify a transfer of title in fee simple (S.C. Code 27-7-10). Grant deeds offer the grantee (buyer) more protection than quitclaim deeds, but less than warranty deeds. A grant deed differs from a quitclaim deed in that the latter offers no warranty of title, and only conveys any interest that the grantor may have in the subject estate. Grant deeds guarantee through implied covenants that the title is free of any encumbrances (except for those stated in the deed) and that the grantor holds an interest in the property and is free to convey it. A warranty deed offers more surety than a grant deed because it requires the grantor to defend against claims to the title. A lawful grant deed includes the grantor's full name, mailing address, and marital status; the consideration given for the transfer; and the grantee's full name, mailing address, marital status, and vesting. Vesting describes how the grantee holds title to the property. Generally, real property is owned in either sole ownership or in co-ownership. For South Carolina residential property, the primary methods for holding title are tenancy in common and joint tenancy. A conveyance of real estate to two or more persons creates a tenancy in common, unless a right of survivorship is expressly created in the conveyance (27-7-40). In addition to meeting all state and local standards for recorded documents, a grant deed requires a complete legal description of the parcel. South Carolina requires either a metes and bounds, or a lot and subdivision description, or a reference to the plat book and page that provides the legal description. Recite the prior deed reference to maintain a clear chain of title, and detail any restrictions associated with the property. The completed deed must be acknowledged by the grantor (and his or her spouse, if applicable) in the presence of two witnesses (30-5-30). A transfer fee is levied based on the consideration paid. If there is no consideration paid or the transfer is exempt from this fee, state the reason for the exemption on the face of the deed. See S.C. Code 12-24-40 for a list of exemptions. Real estate transfer fees are due upon recording, unless an exemption is claimed. Contact the appropriate Register of Deeds office for up-to-date information on transfer fees. Conveyances of realty in South Carolina require an affidavit that states the true consideration or an exemption (12-24-70(A)(1)). See S.C. Code 12-24-40 for a list of exempt documents. The affidavit should be signed by a person connected to the transaction. Jasper County has a county-specific affidavit that must be recorded with the deed. Record the original completed deed, along with any additional materials, at the Register of Deeds office in the county where the property is located. Contact the appropriate Register of Deeds to verify accepted forms of payment. This article is provided for informational purposes only and is not a substitute for the advice of an attorney. Contact a South Carolina lawyer with any questions related to the transfer of real property. Reply from Staff: Thanks for the kinds words Elijah, we really appreciate it. Kimberly M. said: Great service. Very helpful and quick. Love Deeds.com and will be using their services again. Reply from Staff: Thank you for your feedback Kimberly, we really appreciate it!